“What really makes an instrument musical is that a musician decides to make use of it.” ~ Allen Strange, Electronic Music: Systems, Techniques, and Controls (2nd Edition, 1983, p. 2). 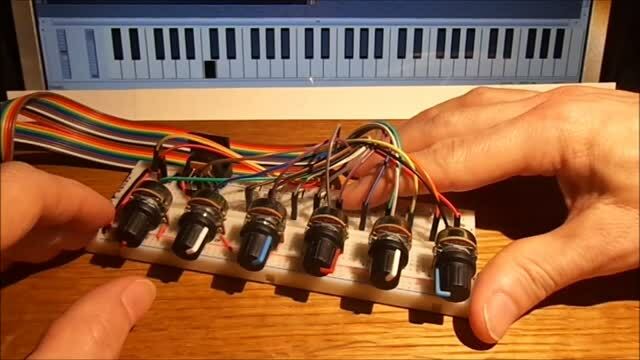 This post documents two circuits connecting an Arduino to electronic controls on a breadboard and the programs necessary to generate basic MIDI note commands. These circuits can be used to make music, conduct experiments, or both. 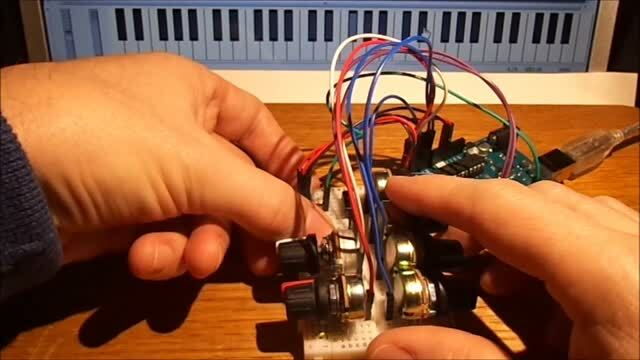 For an introduction to Arduino and MIDI, please see Arduino and Midi for Beginners. Or, you can skip all this backstory and just watch the videos: Boogie Bass or Mathematical Midi. There are two circuits. One circuit is larger (full-size breadboard) than the other (half-size breadboard). Both circuits wire 6 potentiometers (pots) to the 6 analog-to-digital (ADC) converter pins of the Arduino board. The pots are wired in the standard way with the low pin (far left turn of the pot) set to ground (0 volts is converted to the number 0) and the high pin (far right turn of the post) set to 5v (5 volts is converted to the number 1023). The middle pin captures the position of the dial and sends that voltage to the Arduino board which converts it to a number (analog voltage to digital number). Both circuits include an On-Off switch on the breadboard. This does not control power to the Arduino or power to the breadboard. It is an additional switch to be used in a program to start and stop some action within the program. It is wired to pin 12 of the Arduino which is read as an input (0v = 0 or LOW; 5v = 1 or HIGH). The smaller circuit includes 2 momentary switches that remain “on” only while you are pressing down on the switch. The larger circuit has 10 of those switches. These momentary switches are read by the software in a slightly different way than the On-Off switch. Notice that one end of these switches is plugged into the ground (0 volt) bus on the breadboard; the other end is connected to the Arduino pin. Long story short, the Arduino reads a pressed switch (on) as 0 and a not-pressed switch (off) as 1. This is the exact opposite of the other switch on pin 12, but the code explains this difference. The larger circuit includes a MIDI OUT jack for connecting the circuit to classic MIDI hardware (5-pin socket, two 220 ohm resistors, wired as required). The program includes a line to set the serial rate for classic MIDI (31250 baud) or virtual “hairless” MIDI (115000 baud). For each circuit, there is a diagram of the circuit rendered using Fritzing. There are also pictures of real versions of the circuit as-built. There are some differences between the Fritzing diagram and the built circuits: different colored wires, knobs, positioning. The resistors on the MIDI 5-pin fan-out on the Fritzing diagram and fan-in on the built circuit. But the Fritzing diagram and pictures are functionally equivalent. For each circuit, there is an initial program written in Arduino to get started. The circuits with the corresponding programs will work. These circuits are intended as a reference for getting started. They only begin to capture the range of possibilities for this kind of circuit. In fact, all of this together is just a little pile of electronic parts and some code. What makes it musical is what a musician decides to do with it. This video demonstrates how it works. Below that is the circuit digram. Following the circuit diagram are some pictures of a real version of the circuit as built. This program reads 2 digital switches and 6 ADC sensors. for HAIRLESS MIDI (software serial connection). clarinet. That didn't stop Messiaen. //  LOOP that will cycle endlessly. // Check to see if the ON/OFF switch is on. // If so, proceed. Otherwise, keep checking. COMMAND 0x90 sends NOTE ON on Channel 1. PITCH is the note from 0 to 127 with 60 as middle C.
outside of their normal real acoustic range. but is often perceived as volume. so that is often used instead of a note OFF command. This video demonstrates how it works. Below that is the circuit digram. Note the inset picture of a MIDI jack as connected to the breadboard. Following the circuit diagram are some pictures of a real version of the circuit as built. ON/OFF switch connected to pin D12. should be adjusted in the setup function. // Initial value = 1 which leaves the timing unchanged. Circuits circa 1970, woodgrain all the way. This entry was posted in Arduino, CODE, MIDI. Bookmark the permalink.